If you’re looking for a sweet cocktail, something more historic than the Cosmopolitan, I can think of no better place to start than the Martinez. The Martinez is the proto-Martini. The newly-invented Martini had many recipes in the 1880s, and went by many names as it tried to sort out its identity. In some quarters it was the “Martini;” in others, the “Turf Club;” often, it was the “Martinez.” Modern bartenders have settled on this last name, “Martinez,” to differentiate that early cocktail category—it’s more of a concept than a single drink—from today’s evolved Martini. So what’s in a Martinez? The thing that makes this drink the “Martinez” and the modern drink the “Martini” is the shift from sweet to dry, in both the gin and the vermouth. The flavor profile is entirely different between the two drinks. 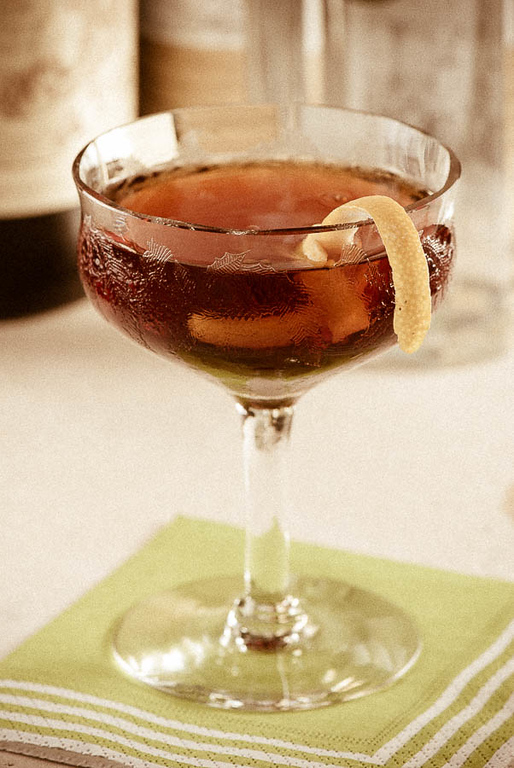 Another characteristic that separates the 1880s Martinez (or Martini or Turf Club) from the modern Martini is that the former was unquestionably a vermouth drink, not a gin drink—two parts sweet Italian vermouth to one part Old Tom gin, usually with bitters, and often with dashes of Maraschino liqueur or some other amendment. It’s a very sweet formulation by current standards. While some modern recipes stick to the “authentic” two parts sweet vermouth to one part Old Tom gin, others present it in more current form—drier, and more gin-heavy to accommodate today’s tastes. Some current recipes call for equal parts gin and vermouth; some go as far as to call for two parts gin to one part vermouth, and some abandon the sweet Old Tom gin altogether, replacing it with London Dry—in a sense, reinventing the original 1890s evolutionary path of the Martini. Stir with ice until well chilled. Strain into a cold cocktail glass. Garnish with lemon. Regular readers know I’m not fond of sweet cocktails; when I first encountered this version of the Martinez, I expected it to be undrinkable, but curiosity (and credibility) demanded that I try it. To my surprise, it turns out to be quite palatable. It’s a sweet cocktail, to be sure, with the flavors driven primarily by the vermouth, but it works, especially if you drink it stone cold. As I said before, if you like sweet cocktails, this may be your classiest choice ever. Can you make the Martinez seem “less sweet”? First of all, the equal parts variants, with equal parts Old Tom and Italian vermouth: these turned out to be my least favorite—neither fish nor fowl, they seem watered down, though it’s hard to decide if it’s the gin or the vermouth that’s not standing up to the job. Stir with ice until well chilled. Strain into a cold cocktail glass. Optionally garnish with lemon. The main flavor driver is still the vermouth, even in this reduced proportion. The M&R Rosso provides a darker, more severe complexity of flavor than the Carpano; specifically, it doesn’t have the aggressive lushness and the strong vanilla note that seems to dominate the Carpano version. I don’t know how the original recipe’s Bokers Bitters affected the overall flavor of the Martinez, but the readily-available Angostura combines very well with Italian vermouths, cutting into the sweetness in a way that orange bitters do not. The added complexity is a bonus to the overall cocktail. So that leaves us with two versions of the Martinez: the very sweet, and very educational, “original” version from the 1880s; and a drier version that may or may not represent some middle step in the 1890s evolution toward the Martini. I find the original, vermouth-heavy version growing on me, especially if I mix with a drier gin like Junipero. Not what I expected at all. There is no end to the surprises in cocktailing. If you enjoy the Martinez, you might want to try other gin-and-Italian vermouth classics; notable examples include the Hanky Panky, Satan’s Whiskers, and of course the Negroni. “Searching for the Martini — The Martinez cocktail” at cold-glass.com : All text and photos Copyright © 2012 Douglas M. Ford. All rights reserved. This sounds great! I’ve never been a big martini person–I’m not big on vodka and I prefer sweeter drinks with dark liquors–and this seems like a perfect variation for me. Your comparison to a Manhattan and the use on Bombay in the dry version pretty much sold me on this cocktail. I’ve been following your posts for a while, and I really love this blog. Cocktailing is a bit of an hobby in my family and we’re always on the look out for new recipes. Great stuff! Definitely give the Martinez a try if you enjoy your cocktails a bit on the sweeter side—I look forward to hearing if you enjoy it. It’s always uplifting to hear that readers are enjoying Cold Glass, and I’m delighted that you’re sharing it with your family. I’ll definitely keep doing my best. Thanks. I tried the drier version of the Martinez the other day. It was a winner. Definitely will become a regular on the “drink of choice” list. I’m delighted that the drier version suited you—thanks for checking back. I have yet to go wont he ‘origins-of-the-Martini’ road fo explroation, but I look forward to doing it sometime soonish. I was interested in your comment about how 2:1 worked, 1:2 worked and 1:1 didn’t. I had exactly the same thing trying variations on Gin and Dubonnet. Gin with Dub was good; Dub with Gin was good, but it wasn’t so nice when it wasn’t sure what it was. Ah, so I’m not alone on that 1:1 thing; that’s reassuring. Sometimes, as with the Martinez, it just leads to a big muddle of flavors. Mystery is often fun, but not when you can’t figure out what kind of drink you have in your hand. Ah, state fairs. It looks like Texas is very much into deep-fried everything. Here in Minnesota, it’s anything-you-want on a stick. Thanks (I think) for the link. As for fried cocktails: I’ve never deep-fried anything, so my credibility there is zero. It’s hard to imagine how to manage such a stunt—the typical deep-fryer runs a couple hundred degrees hotter than the boiling point of ethanol; I would think it would make a pretty exciting moment, when the Margarita hits the oil. I suppose if you had something like a Jello shot, to hold the drink in place, then beer-battered it, maybe you could actually pull such a stunt off. No. Sounds disgusting. I’m dropping the whole plan right now. Mezcal, maraschino and sweet vermouth, an interesting idea. Thanks! Great pics and writing as usually, your blog really inspires me, thanks! I’ve ordered a Martinez only twice. The first was pale in the glass but elegant on the palate. The second, from a different bartender at the same bar, was dark and disappointing. I haven’t yet been able to justify shelling out the bucks for a bottle of Luxardo. And I’m always on the look-out for a mini-bottle, a fool’s errand, it seems. Your guidance here might help me coax the winning version from a bartender. Thanks! 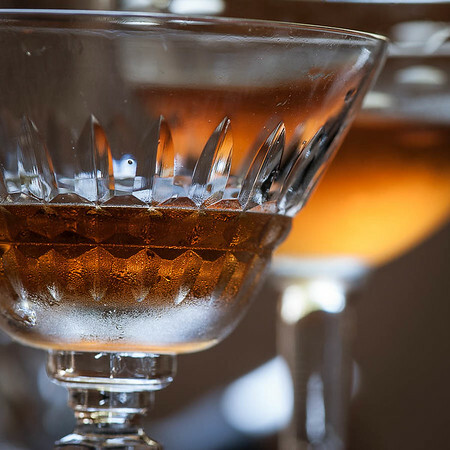 “Pale in the glass” suggests that perhaps the first Martinez might have been made with dry (white) vermouth, instead of the more typical sweet vermouth. The proportions could also be in play, specifically more gin and less vermouth could result in a “paler” drink, with the vermouth playing a smaller part in the overall flavor. It’s an interesting question, thanks for asking. One of my local restaurant bars had an interesting take on the Martinez. They called it the “Southern Martinez”, and it contained only Barrel Aged Bluecoat Gin and High Wire Southern Amaro. That’s an interesting approach. I wasn’t aware of High Wire. Thanks.